A late or more probably post Medieval pan weight cast in lead, This crude 1 ounze weight is a flat cylinder in shape, with an irregualr raised lip around the perimeter on both sides. The weight is plain with no surface stamps or decoration. It has a cream patina coloured surface patina. 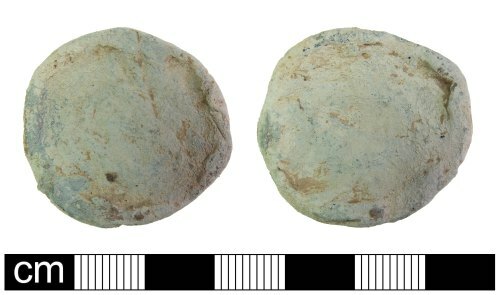 Similar stacking weights often in copper alloy are known from the Post Medieval period (Henry VII and later). The weight weighs 30.5grams, which is 1.08 Ounces. It has a maximum diameter of 31mm, and a maximum thickness, at the rim, of 6mm.